Divided into three chapters (Mother, Father and Family), this is a distinctive, disturbing insight into a sheltered, lonely existence from debut feature writer-director Nicolas Pesce, a graduate from the worlds of animation and music video. Played remarkably well at different stages by Kika Magalhaes and Olivia Bond, Francisca is the daughter of a brilliant Portugese surgeon whose existence takes a defining turn when a deranged, gun-toting stranger shows up at their remote farmhouse. 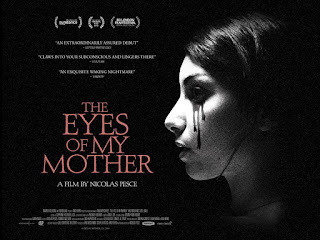 The sympathetic, tragic protagonist offers a rare female variant on the kind of mother-dominated, alienated disturbed males of post-PSYCHO horror cinema, and the film’s focus on a young girl’s warped coming of page has echoes of the chilling, unique THE LITTLE GIRL WHO LIVES DOWN THE LANE. There are specific thematic and visual echoes to movies as diverse as Bigas Luna’s ANGUISH, Lucky McKee’s THE WOMAN and Miike’s AUDITION. Pesce cannily keeps the violence entirely off camera, while finding far more disturbing personal horrors in deceptively quiet scenes of the grieving Francisca maintaining an illusion of normality as she manoeuvres, sleeps with and bathes the corpse of a parent. With minimal dialogue and a confined backdrop, the movie is strikingly shot in black and white by Zach Kuperstein and refuses to exploit potentially exploitative material – leaving us with an overwhelming sense of melancholia, rather than disgust. Click HERE to see cinema listings for U.K. and Republic Of Ireland screenings.